Here is a timeline of events since the disappearance on October 2 of Saudi journalist Jamal Khashoggi, as scepticism mounts over Riyadh's account of his killing in its Istanbul consulate. 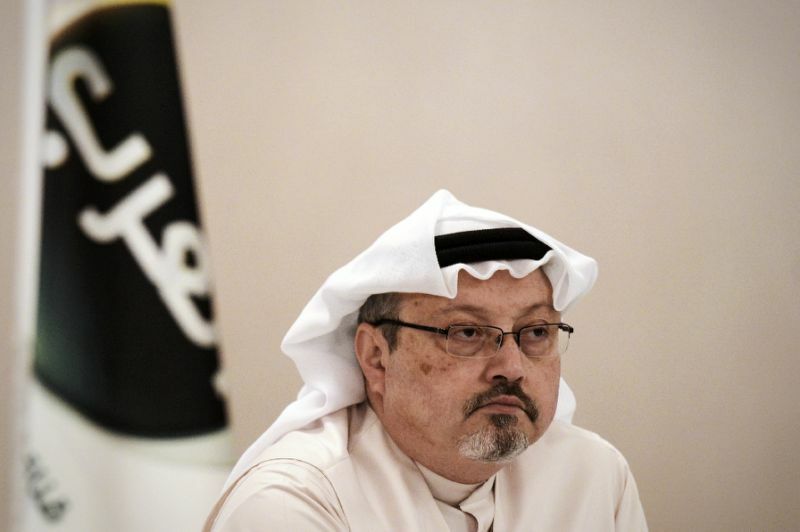 At around 1:15 pm (1015 GMT) on October 2, Washington Post contributor Khashoggi is recorded entering the Saudi consulate in Istanbul by a surveillance camera. The image is published by the Washington Post. He was at the consulate to receive an official document for his upcoming marriage. His Turkish fiancee, Hatice Cengiz, waits outside. On October 3, the Washington Post raises the alarm, saying he has not been seen since he entered the consulate. His fiancee camps out in front of the consulate hoping for news. Turkey insists the journalist is still at the consulate while the US State Department says it is investigating. On October 4, after an initial period of silence, Riyadh says Khashoggi disappeared "after he left the consulate building". On October 5, Saudi Crown Prince Mohammed bin Salman tells Bloomberg that Khashoggi is not inside the consulate. On October 6, a government source says Turkish police believe Khashoggi was murdered inside the consulate "by a team especially sent to Istanbul and who left the same day." Riyadh calls the claim "baseless". On October 8, Turkey's President Recep Tayyip Erdogan asks Riyadh to "prove" that Khashoggi left its consulate. CCTV footage released by Turkish TV shows a van entering the consulate on October 2, before going to the nearby consul's residence. According to The Washington Post, Turkey has recordings made from inside the building that allegedly prove their claims Khashoggi was tortured and killed at the consulate. On October 15, Trump says he received a strong denial from King Salman of any involvement in the disappearance. Visiting Riyadh, US Secretary of State Mike Pompeo says Saudi Arabia promised to ensure a thorough probe from which no one will be exempt. On October 17, Turkish pro-government daily Yeni Safak reports that Khashoggi was tortured before being decapitated inside the consulate, saying it had heard audio recordings of the incident. The New York Times says a suspect identified by Turkey in the disappearance was in Prince Mohammed's inner circle. Three other suspects are linked to his security detail. Trump for the first time says he now believes Khashoggi is dead and warns of "very severe" consequences should Saudi Arabia be proven responsible. On October 19, local media reports that Turkish investigators have searched a forest in Istanbul as the probe into the disappearance widens. Investigators earlier already searched the consulate and the residence of the consul. Turkey's state-run Anadolu news agency reports that Turkish staff members of the consulate have testified to prosecutors. On October 20, Saudi Arabia admits that Khashoggi was killed inside the consulate. Saudi Attorney General Sheikh Saud al-Mojeb says he died after talks at the consulate deteriorated into a "brawl and a fistfight". The public prosecutor says 18 Saudi nationals have been detained. Riyadh simultaneously announces the sacking of top intelligence official Ahmad al-Assiri and royal media advisor Saud al-Qahtani -- both top aides to the crown prince. The Saudi king orders the creation of a ministerial body chaired by the crown prince to restructure the kingdom's intelligence agency and "define its powers accurately", state media says. Trump swiftly endorses Saudi Arabia's explanation, calling it an "important first step". Turkey will "reveal whatever happened" to Khashoggi, the Anadolu news agency reports quoting a spokesman of Erdogan's ruling party. In a joint statement, Britain, France and Germany say on October 21 Saudi Arabia must clarify how Khashoggi died and its account must "be backed by facts to be considered credible". Trump accuses Saudi Arabia of lying about the killing, saying in an interview "their stories are all over the place". Erdogan and Trump agree in telephone talks that the killing needs to be "clarified", according to the Turkish presidency.